When it comes to world-class museum exhibits and awesome Star Wars events, it's a very rare time indeed when we Canucks get the jump on the rest of the world and land something special in our own backyard. 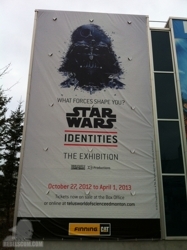 But, thanks to Montreal's X3 Productions, that's just what happened with the Star Wars Identities exhibit, opening this weekend at the Telus World of Science in Edmonton, Alberta, Canada. As X3 is based in Montreal, Quebec, it's only natural that the exhibit first opened there before making its way to Edmonton. Identities opened at the Montreal Science Centre on April 19th of this year and had a very successful run until it closed on September 16th. Ten unmarked semi-trucks then drove non-stop from Montreal to Edmonton and a massive crew laboured virtually around the clock for a month to prepare for this weekend's spectacular opening. But what exactly is Identities? Admittedly, even after seeing some photos from Montreal and reading the description on X3's website, I was kind of in the dark as to what to expect. And I wasn't alone. Despite their enthusiasm, I know a lot of my friends felt the same way and the impression I'm getting is that a lot of people are expecting Identities to just be an impressive collection of original props, costumes and artifacts from the Lucasfilm Archives. It certainly is that - but Identities really is so much more. It's fun, it's interactive and most importantly, it's incredibly educational. Identities uses the magic and science of Star Wars to teach us about ourselves; who we are, what makes us, what factors influence our decisions and how those decisions dictate the choices we make - ultimately making us the unique individuals we are today. And this is where your wristband comes into play – in fact, it really is the most important aspect of the Identities experience. There are numerous stations throughout the exhibit where your wristband is required and at each, you get started simply by scanning it against the panel. From there you're guided through a series of interactive displays, audio hot spots and questions based on technology, biological inheritance, parenting, culture, mentors, peer influence, behaviour and identity, occupation, and values and morals – all things that define your own unique identity, your place in the world and the new character you're creating. You can answer the questions honestly to base your character on you yourself or you can be adventurous and create your own character with various light or dark side traits. In fact, there are over 50 million different outcomes possible so you could never run out of fun character options on additional visits. As you travel through the exhibit, over 200 props, costumes, and displays of original art from the Lucasfilm Archives keep you entertained and serve as the basis for the theme of each interactive station. Many of the props and much of the artwork are on public display for the very first time and are displayed in an incredible manner. Original Ralph McQuarrie and Joe Johnston sketches and paintings, Anakin's podracer, dozens of original models of ships, maquettes, Amidala's wardrobe, Vader's reveal helmet, a full size Vader costume and so, so much more are all here for you to see. Surprisingly, the prop exhibit itself is easily on par with previous exhibits such as The Magic of Myth, Where Science Meets Imagination, and Star Wars – The Exhibition and far surpasses any of the prop exhibits brought out for the Celebration conventions. As you complete the tour and after you've answered all of the questions about yourself, your last stop is before the Emperor himself – and he's here to tempt you. Do you choose the light or the dark side of the Force? What will your final decision be and how will it decide your fate? What will your decision say about your identity and the identity of your new character? After choosing, your Star Wars character is finalized and displayed on the wall before you and you can also have your character profile emailed to you, which you can share with all of your friends via Facebook and Twitter. 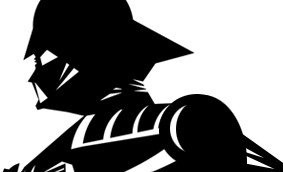 Click here to view My Character. For many of us who have spent a number of years deeply immersed within the Star Wars universe, it's easy to become a little jaded with it all - and admittedly, I feel that way a lot about Star Wars these days. I was bracing myself to experience Identities in that mindset but upon entering the exhibit hall, all of those jaded feelings washed away and in very short order I was beaming like the three year old who saw The Empire Strikes Back for the first time in the theatre. Smiles, from ear to ear. I cannot express enough just how spectacular, engaging and FUN this exhibit is. Think of it as a "Choose Your Own Adventure" book where you have millions of different opportunities to explore yourself and the Star Wars universe. And despite being prepped on how educational Identities is, I was actually blown away by this component. There were numerous points in all of the fun I was having that I had to step away and realize that I was learning something new along the way too. I highly encourage parents and educators to take their children and students to experience Identities while it's here or if it makes its way to a city near you. I, for one, cannot wait to experience it again!